The nature of communication has begun to change dramatically, as face-to-face communication has gradually been replaced by online communication. People's need to express their emotions and thoughts more visually than ever before has triggered an evolution in communication, from verbal to visual. In this sense, the importance of symbols and icons in communication is continuously increasing. Furthermore, this change can be closely related to the marketing discipline. Therefore, this chapter focuses on semiotics as the field of research that studies symbols as an essential part of marketing communication in the digital age. The thing that sells the product is the promise that is given to the consumer and this promise is not touched by hand, nor is it visible. Products and brands are often purchased for their intangible and symbolic values, as well as pragmatic values. Products have symbolic meanings representing lifestyles by carrying meanings beyond identities (Featherstone, 1991). Consumption means the consumption of signs and symbols, not the material objects in the postmodern society. Consumer goods have symbolic meanings and convey indicators of identities where symbolic consumption has become an identity indicator in the postmodern era (Baudrillard, 1998). Consumer culture does not only include the artificial signs created by advertisers and designers, but also the lived environments and social rituals that shape the daily life (Oswald, 2012). In this context, semiotics can enable us to understand the symbolic nature of consumption by analyzing how psychological and social meanings of consumption are produced. Saussure (1916, p. 16) simply defines semiotics as “a science that studies the life of signs within society.” Semiotics also has particular implications for marketing scholars and practitioners. Marketing semiotics, which evolved into a major branch of both semiotics and marketing science, is one of the most fertile areas to examine (Danesi, 2013). Semiotics can be used in several areas of marketing, such as creating a brand image and reinventing brand identity. 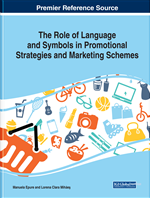 Marketers can better use promotional strategies if they can define the semantics that consumers have developed to code and decode symbolic communication (De Chernatony & McDonald, 2003). Moreover, it is becoming difficult to attract the attention of consumers and focus their attention on a single brand. Today, people have less time to read a text in order to explore something new. In a world where people are too busy to focus on a marketing message, visual communication is exactly what the marketers need to reach the consumers in as little time as possible. This explains the growing trend of using visual content in marketing where visuals are a key to engage people. The rise of visual language in the digital era and the power of images in communication have uncovered a revolution in communication. Communication is increasingly becoming a world of signs, symbols, and icons. The fact that people connect to the internet more than ever before, and communication gradually evolves from verbal communication to visual communication, makes semiotics a vital research method for marketers. Semiotics, which basically means the study of signs, is one of the most used research methods in the analysis of advertisements and brand images. While traditional market research methods ask consumers about their opinions, semiotics unfolds the underlying motivations of their responses. While the intersection of semiotics and marketing disciplines has been well researched, marketing semiotics in the digital age has received little attention from marketing scholars and practitioners. Therefore, the present chapter expands the literature on semiotics by examining the concept in terms of the communication revolution in the digital age. The chapter aims to respond to some questions, such as how the digital age has caused a fundamental change in the way we communicate and what is the importance of this change for marketers. How brands can benefit from semiotics is also a question that the chapter tries to answer. The chapter also offers practitioners some strategies to be implemented in marketing communication in the digital era. The introduction section gives information on the importance of semiotics in marketing, where communication techniques evolve from verbal to visual. Following the introduction, the next section presents marketing semiotics as a qualitative research method and examines issues such as semiotic analysis in brand communication research. The chapter then explores the rise of visual communication and the use of emoticons and emojis as non-verbal language forms in the digital age. Lastly, the final section includes strategic implications for marketing practitioners and suggests a number of future research directions. Emoji: Pictographs of faces, objects, and symbols that convey the sender’s emotion or idea in electronic communication. Pictograph: Graph that conveys information by using pictures, symbols or icons. Emoticon: Pictorial icons that represent emotion or sentiment in computer-mediated communication. Marketing Communication: Main part of a company’s marketing efforts to convey messages about the products and the brands they sell. Visual Communication: A type of communication which mainly includes pictures, images, symbols, icons and so forth. Digital Age: A period characterized by communication based on information technologies. Marketing Semiotics: A major branch of both semiotics and marketing that deals with signs and symbols.